Marvel vs. Capcom: Infinite - Battle for the Stones has begun, but it was also the game's first weekend in the competitive space. Here's what we learned. Marvel vs. Capcom: Infinite hit store shelves one week ago, but Capcom wasted no time in thrusting the game into the esports scene. The first tournament in the Marvel vs. Capcom: Infinite - Battle for the Stones event took place this past weekend at SoCal Regionals in Anaheim, CA, bringing out the top players in the Ultimate Marvel vs. Capcom 3 scene. A few of the top players struggled to make the transition, as they continue to spend time in the lab. Others took to the game right away, putting together teams of the strongest characters, along with the right Infinity Stone, to guide them to victory. There are a handful of lessons that the average Joe can take from watching SoCal Regionals to help carry them into the future and Shacknews is here to break them down. The tail end of Ultimate Marvel vs. Capcom 3 saw lighter characters like Morrigan and Zero carry many pros to success. A large part of that was because some of their strategies were straight-up broken, with Capcom unable to issue any kind of balance fixes due to the lapsing Marvel license. Unblockable lightning loops and Soul Fist spam were often the order of the day at the top of the Marvel food chain. But the effectiveness of these two characters has been greatly reduced in the transition to Infinite. 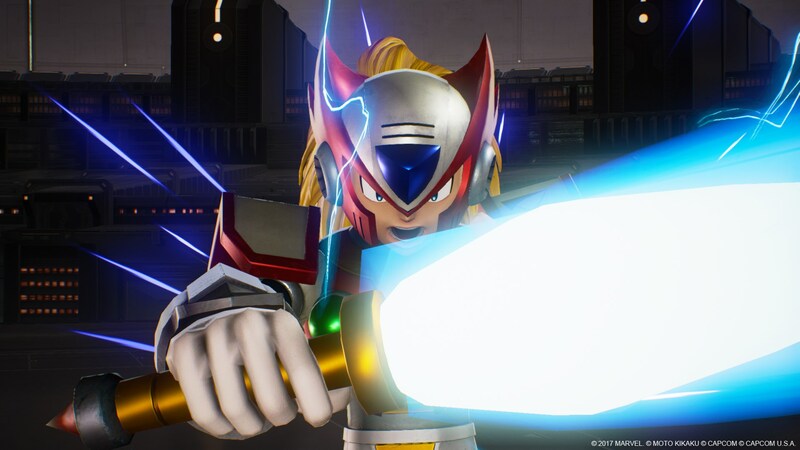 Zero's formerly inescapable lightning loops are not as unblockable as they used to be and top players have even found outright counters, whether it's through the Active Switch system or the Infinity Stones. Spectators and pros have gone so far to say that Zero's now a bad character. That's not entirely true, given what Martin "Marn" Pham and Jonathan "Cloud805" Morales have been able to do with the character. Zero is still good. He's just not broken anymore, having been brought down to earth with the rest of the field. Morrigan's Soul Fist spam used to be the bane of the UMvC3 scene and had the potential to get worse with the addition of the Time Stone. But the other Infinity Stones, along with the Active Tag system, have made it much easier to keep up with Morrigan's shenanigans. Pile that onto the succubus' overall slower speed and she's a blip on the radar these days. No, to rule the Marvel vs. Capcom: Infinite roost, it's time to think bigger. Big bodies dominated at SoCal Regionals. Gabriel "Jibrill" Lam brought a Haggar/Thanos team into Top 8. Robert "Sacktap" Capps took a former bottom-tier character in Nemesis and rode him and Haggar all the way to a runner-up spot. Then there's Ryan "Filipino Champ" Ramirez, who dominated the whole weekend using a certain flame-headed demon. Nobody dominated the weekend more than Dormammu. The ruler of the Dark Dimension was already a powerful character in UMvC3, but he has undergone some mind-boggling upgrades in the transition to Infinite. Where to begin with him? How about his Dark Spells, which were manual inputs that could boost his special moves? In Infinite, those inputs aren't so manual anymore. This matters in particular with one of the Dark Spell effects. When stacked, Dormammu can create a bed of fiery thorns, essentially making the floor lava. It's a move commentator Michael "Yipes" Mendoza dubbed "The Rose Garden." This is one of the strongest special moves in the game, because of its sheer utility. It can stretch out combos, catch tags coming in, set up Hyper Combos, and close out distances. It completely wrecked Zero players and few other players had any answer for it. Filipino Champ took advantage of this move to its maximum potential, keeping opponents grounded and, at its peak, using it to create one of the largest combos the game has seen to this point. 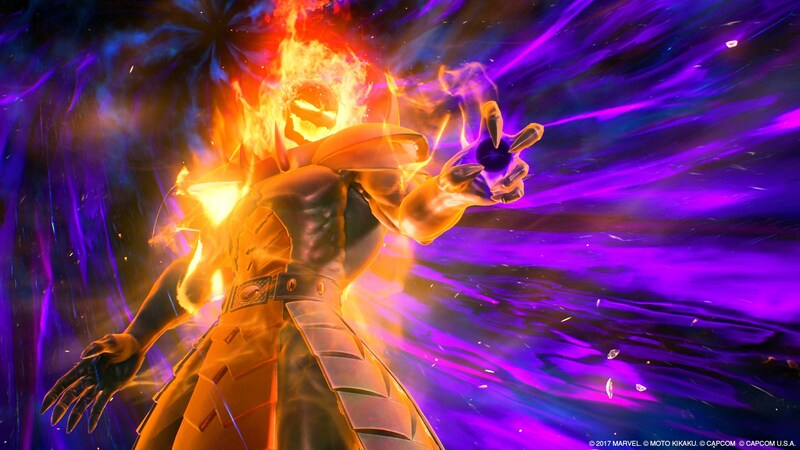 Character tier lists are bound to hit the internet following the first week of Marvel vs. Capcom: Infinite, but there is little doubt that Dormammu will be at the top. He's downright fearsome. The Infinity Stones all have their uses, with some working better on some characters than others. A vast majority of the top players at SoCal Regionals, however, utilized the Reality Stone. Like Dormammu's Dark Spells, the Reality Stone's Infinity Storm is a powerful utility tool. Its elemental strikes can be unpredictable and hard to avoid, especially when opposing characters are showing up to try and strike. Because they can hit at any time, going on the offensive while on the wrong end of this Infinity Storm is a perilous proposition. Some have tried to fight back, but one elemental strike in particular has the power to momentarily freeze players in a block of ice, stopping their onslaught in its tracks. The Reality Stone is also a reliable projectile, even for characters that don't get one. This allows players like Sacktap to trot out a Haggar/Nemesis team and still get to keep opponents at a safe distance with the Reality Stone's Infinity Surge. 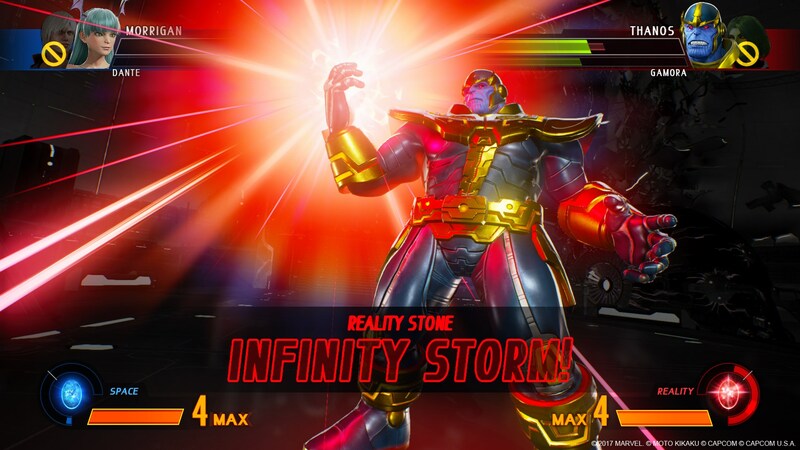 It also means there are two massive bodies coming in when the Reality Stone's Infinity Storm goes off, meaning opponents have to ward off a projectile parade, as well as close-up command grabs and heavy strikes. There are still a few people that used other Infinity Stones, which leads to this quick sidebar. The importance of Infinity Storm order was never more evident than with the Soul Stone. 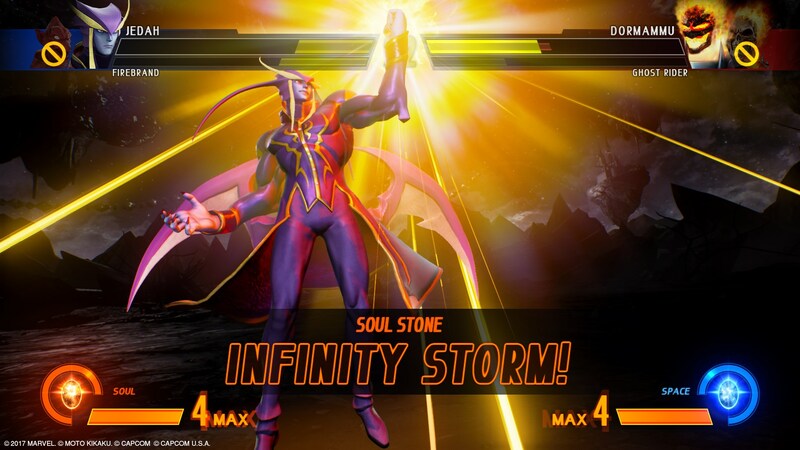 The Soul Stone Infinity Storm has the potential to lead to major comebacks, as evidenced by Richard Nguyen's mastery of it over the course of his journey to third place. If a player gets sloppy, the Soul Stone user can bop them with both of their characters and turn the course of the game around. However, they first have to use the Soul Stone and this is where it's important to note that two Infinity Storms cannot be active simultaneously. Some players adopted an intriguing counter to the Soul Stone and that's banking their own Infinity Stone meter for the end of the match. If one opposing player goes down, triggering an Infinity Storm immediately will prevent the opponent from using the Soul Stone to resurrect their partner. It forces the opponent to wait out the Infinity Storm and, in most circumstances, they may not have sufficient health to do so. This last one is strictly for the esports side of the game. Marvel vs. Capcom: Infinite goes quickly. Even with upped health bars and far fewer infinite combos, the quickness of the Active Tag system and the pure damage potential from the Infinity Stones have made games fly by fast. Need proof? Look at Friday evening's "First to 5" exhibition between old Marvel rivals Justin Wong and Christopher "ChrisG" Gonzalez. It lasted a mere 15 minutes. The exhibition between Filipino Champ and Daniel "Clockwork" Maniago? Only 13 minutes. Games move far too quickly for both players to adjust and for spectators to enjoy themselves. This is why some of Marvel's top players have advocated for a "Best of 5" format across the board, similar to how Ultimate Marvel vs. Capcom 3 was run. I feel people don't properly understand why Marvel should be 3/5. I really wanna write up a big post, most likely once I'm back from SCR. SoCal Regionals operated with a "Best of 3" format until the Top 8, at which point the format went to "Best of 5." As a spectator, it felt tougher to get engaged with Saturday night's Top 32 action because players were coming and going from the stage so quickly. That's more likely to happen during sets where a player is feeling off or during a bad matchup. "Best of 5" allows for more experimentation with matchups, counter picks, and all of the fun stuff that makes competitive fighting games fun to watch. With Infinite in its infancy, there's hope that Capcom will come around on the format in the coming months. In the meantime, grab your popcorn quickly, because that "Best of 3" match might be over before you get back to your couch. Did you watch SoCal Regionals, CEOtaku, or any other tournament running Marvel vs. Capcom: Infinite this weekend? Join the conversation and offer up your own observations in the comments. I thought it was a good tourney overall, with decent character variety except for the thousands of Ultrons - and I'm not just talking about his Level 3 Super. Professor Cox (Sacktap) should be proud to take a Nemesis into Grand Finals. But he faced the broken FLOOR IS LAVA AHHHHHH! I found it interesting how so many Big Names from other fighting games who most definitely did not compete in Marvel 3 are playing Infinite. That didn't really happen with Mortal Kombat X, Injustice 2, Tekken 7, Guilty Gear Xrd, Blaz Blue, Uniel, etc. It kind of happened with Killer Instinct and the first Injustice, and maybe the first 3-4 weeks of King Of Fighters XIV. But we'll see how long people like Punk and Chris T stick with Infinite. Also, 266 hits is just buckwild.Most I remember from MvC3 was 190-ish by IGT's Ghost Rider. Then my fighting was mostly in the era where a 7 hit combo was the end of a round (not counting like Chun Li's Lightning Legs or Honda's Slaps).